"Sensitive Areas" But Can't Fit A Grey Water Tank? The solution we chose is both simple and inexpensive. As Grey Nomads, there is increasing pressure on us, in some areas of Australia, to not discharge our Grey Water onto the ground. Even so, there are hundreds of Caravan Parks around Australia that encourage us to "water the plants and trees" in their park. But the power of the Greenies... those radical, small minded minority, are causing submission in some areas. Rather than fight, most of us are prepared to conform, so that we may enjoy those few areas demanding compliance. To that end, I have been looking for a portable water tank, suitable for the collection and storage of grey water, for later disposal. There are a number of Blue Tanks offered on eBay, that I'd been watching for several months. The prices floated around the $120 mark. After a while, they gradually reduced down to about $89 and I was almost going to buy one, when I came across this Gray Tank (exactly the same as the dearer Blue model) for a very reasonable $54 delivered. I have since made up connections to feed our Grey Water into the tank. Our setup should now allow us to camp in "sensitive areas"... which should satisfy the Environmental Nazis. 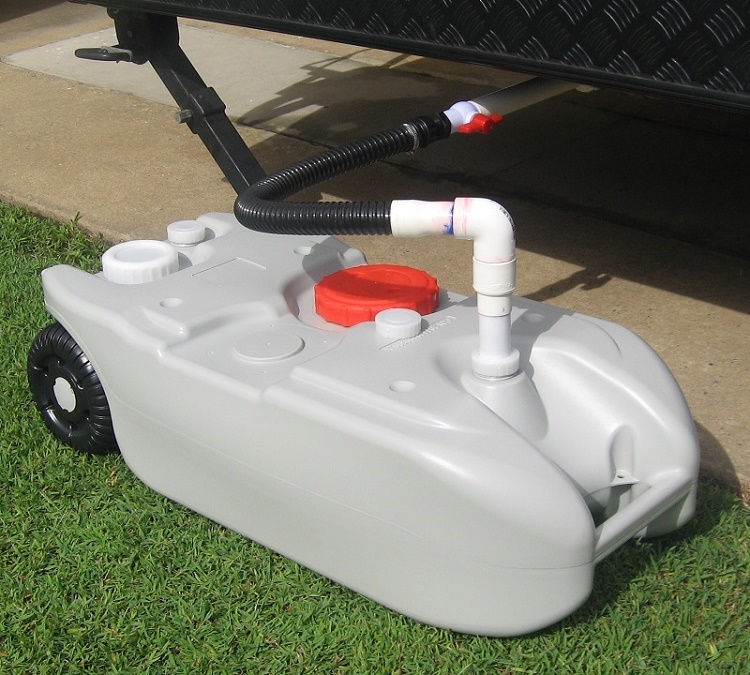 I can thoroughly recommend this tank to fellow Grey Nomads looking for a suitable, low coast solution to grey water retention. Depending on where we are going and how long we'll be gone, we don't always need the 40 litre tank. In that case, I have made a smaller, 20 litre tank that functions just as well. 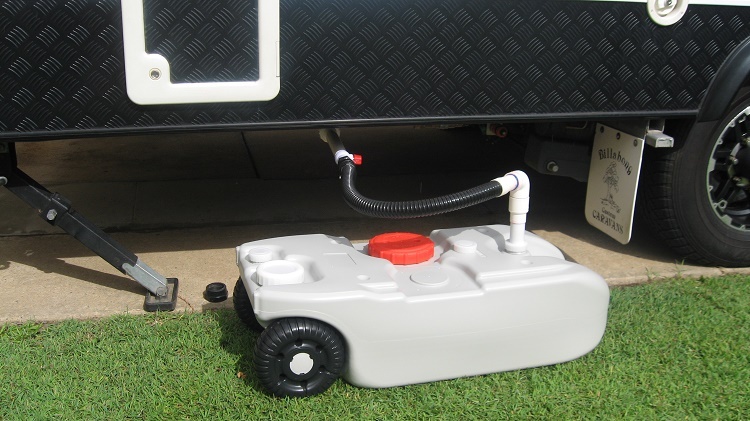 An interesting feature of this design, is the ability to disconnect the tank from the van, without spilling grey water on the ground. 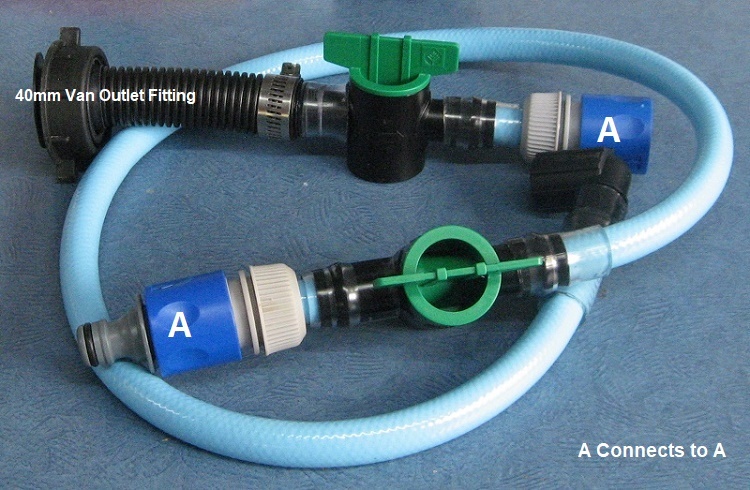 This is achieved by a simple connection, made up of hose fittings and 2 plastic taps, with disconnection between them. The water in the pipes from your shower or sink, stays there until you reconnect the waste tank and open the taps.